Our My Kingdom for the Princess IV Walkthrough is live and ready to act as your loyal guide to help you complete 50 levels of intense time management gameplay. Put our detailed, step-by-step instructions as well as carefully marked screenshots to work for you as you help Arthur on his task to save the princesses of the world. 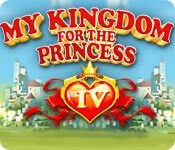 Welcome to the My Kingdom for the Princess IV Walkthrough. With step-by-step instructions, screen shots for every level, and videos for the hardest level, you will have all you need to get gold on every level. This game has a bizarre and, what I find to be annoying, "sliding effect" where the islands move around. To turn it off, open the Options and unclick the Sliding Effect option. Different in this game is how resources and obstacles are actually "piled up" on one another. When looking at the information bubble, note the x2 or x3. This means you will need to return that many times to pick up all the resources or clear the obstacle. Hovering over an item will bring up an information bubble about the item and a colored circle around the item. Blue circles--accessible, resources available, but no worker; however it is now possible to queue up work. Orange to Yellow circle--not enough resources yet; clicking on the item will show how many more of the missing resources you need. Available tasks can be queued up. To cancel just click again. Little green check mark shows the tasks that are in the queue. Note that you do not have to access to a building to build or upgrade but you do have to access to restore. Along the bottom right is a bonus bar that fills up as the level progresses. Using the bonus move the bar back. Along the bottom right you will see a bar when a bonus is in use showing how much longer it will be available. Abundance: Renewable resources will renew faster; if you click on it, all the areas that have renewable resources will sparkle. All renewable resources are circled on the screenshots. Collect Double: Workers pick up 2 units of resources from piles on the ground. Fast Run: Workers run faster. Fast Work: Worker work faster. Extra worker: Hire another worker for a short period of time. Rocket Gun: Dragonets will be immediately shot out of the sky for 2 minutes. Taxes: Production buildings' outputs will be doubled. Large Discount: Cost for remove obstacles and building roads will be cut in half. You can queue up as many as possible during the bonus time. Here and Now: Instantly finish time cycle to get resources from production buildings. Freeze time: Stops the clock for a period of time. Dragonets: You can't click on an resource or obstacle when dragonets are in the area. Click on each dragonet once to get rid of them. On some levels you can build and ugprade a Sky Crystal which will help remove them. Sometimes just repeatedly clicking on the location will allow you to get out during a break. If available a Rocket Gun bonus will remove the dragonets for 2 minutes. There are no warehouses in this game. At all levels, your resources are limited to 20 of each at a time. There are Achievements available in the game. At the time of writing this walkthrough, there is a glitch to achieving the final Achievement. They are self-explanatory.